As you are all aware my mobile technician (aka Ren) was pressed into helping with my shims and tappets last week. With the snow I have not used the bike for work and gone in the car. However on Saturday I used the bike and returned home on a crisp and very cold winter's evening at 7pm. When I arrived in the garage I noticed my right leg had a big round wet patch on it. I felt the stuff which I initially thought was oil. It was quite slippery and appeared to be engine oil. As I had just changed the oil and filter it looked like fresh clean oil does. I decided to have a look the next day and the right hand side of the bike was a bit oily, I could see drip marks from near the cylinder head gasket. Hmm. I had sprayed ACF50 on the engine so I wiped down the bike and ran the engine. No sign of a leak... The rocker cover looked OK but there did seem to be a slight drip near the round disks that are part of the rocker cover. I rang Ren and obviously he was concerned. He suggested perhaps a fork oil leak or possibly the crankcase cover where we rotated the engine to TDC could be at fault. I had a quick look but family visits forced me to look on the Monday morning. I took off the side cover and the front fairing which both came off pretty easily. I just forgot the little plastic push in fixing. I was quite impressed with myself for getting the bike to this stage, Ren's tuition obviously did the trick. I cleaned everywhere I could and took the bike for a spin. I did 2 miles and stopped at Mottram to have a look. I couldn't see anything leaking or oil blowing out. Very strange. I drove 3 miles down the motorway and as I pulled off I could see some fluid flying off near my knee. I rode home and saw the problem. Erm - ignore the heavy breathing I was bloody frozen, I had only put a thin scruffy jacket on for the ride. (Idiot, it's bloody winter). The top radiator clip was fitted and pretty damn tight but fluid was dripping out. 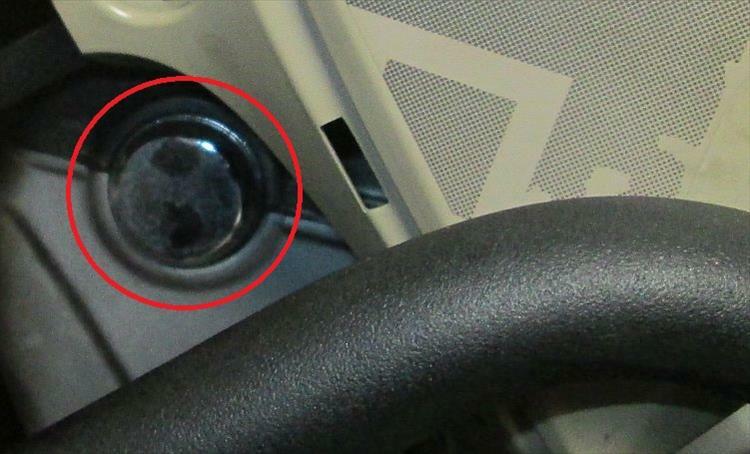 I then noticed the clip was about 5-6mm further back from the radiator than it used to be. Bloody difficult to move it's quite a tight fit under there. I moved it along 5mm with a bit of huffing and puffing and shoving with a screwdriver on the side. Ha that's got it. Peter the mechanic, I'm quite impressed with moving that along. Going to change my middle name to REN. Right how much fluid have I lost? Quite a bit by the look of it. I wriggle under the rear wheel and clean the expansion tank with some Muc Off spray. Damn I can't see see bugger all. I try and rock the bike, still nothing. It's like a white plastic tub with a min line and a max line but I can't see the fluid, I can't see anything moving. Maybe it hasn't got any coolant left! I try again. Eventually after putting my heavy bike chain and my helmet in the top box the bike rocks a bit easier and when the torch is just in the right place - voila! You see coolant. God I am getting good at this bike fixing stuff. "hmm not sure just a minute. It doesn't say on the bottle, just a minute... It's the one Honda sends us, it's fine no one's had a problem." I explain about the aluminium corrosion problem. "Err this is fine." I point out the manual states it must be the proper one or the warranty will be invalidated. "look on the barrel it's got a sticker on it." He reads the sticker which states "Not suitable for Magnesium Alloy Engines." He then states "Your engine's aluminium so its fine! I can get the other stuff but only in big bottles but it will take a few days." Somewhat bemused I say OK no problem I will think about it. Hmmmmm. I remember seeing something about this on the internet regarding certain Rover engines with an alloy block. This resulted in the cooling passages blocking due to corrosion and eventually blowing the cylinder head gaskets. This was as a result of poor head gaskets which were being corroded by the incorrect coolant. Honda blocks are made of 319 Alloy. A quick search on the internet reveals the correct coolant - OAT and silicates free at Halfords. I click and collect it online. £12.50 for 2l. After a trip to Asda and Halfords I return to the garage but I cant find the filler pipe I made from a bit of old hosepipe for Ren's visit. Never mind I cut another bit off the hose pipe. Hopefully Paula wont notice. I put two glugs in remembering Ren hardly put any in when we removed the pipe. I get under the bike and it's much easier to spot the fluid now just under the top line so that's good. I put on a little more substantial clothing this time and pop off to test it on the same route. I take her up to 80 on the short stretch of motorway. My leg looks dry. After a good look around the bike all appears well. So what have we learned REN? That Honda bikes are awful to work on lol. But I'm not looking at the negatives here I'm looking at the positives. My bike is running a treat. I learnt to identify a problem and take the damn thing apart as per Ren's instructions. I've fixed a tiny little problem which could have happened if I had taken it to Honda. Who would have thought that clip could have caused a leak when it wasn't quite in the right place. So really its turned out quite well. Except for the dealer. Hmm I think I will email Honda and checkout what they say, might be interesting if they think the coolant is fine. Pete I thought you had just filled up with Halfords pink stuff, is the new stuff you picked up from Halfords different? That post crossed in the post so to speak. I filled up with the very pink looking halfords stuff prior to when Ren posted this post, post leak so to speak. So my previous fill up was this one mentioned in this post as well as the other post which your wernt aware off because of rens late posting of this article. Suffice it to say I filled my bike with pink coolant from halfords when it needed topping up.. I gotta post this question ... isn't the stuff leaking out blue? Yes the bike contains an unknown blue coolant which may or may not be the correct coolant. As it came from the factory/dealer like that. I have simply topped up with pink stuff which is supposed to be the correct coolant according to Honda which I got from halfords as I couldn't get the right stuff from the two local Honda dealers. Ah i think i see, when you said you poured in the pink stuff, you meant you topped up. I mistakenly thought you had changed the coolant out to the Halfords OAT. Now that you have found the leak I would be tempted to drain the system and fill up with the OAT coolant from Halfords. I called Rock and they confirmed that the Rock oil ICE silicate free coolant was blue, i drained the coolant and filled up with Halfords OAT pink stuff and ran the bike for another 15k with no problems. You really don't want to mix OAT and non-OAT as they can cause sludge. Not a good thing in the cooling system. See link. If I was you I'd flush the whole thing out with clean water and refill with the correct concentration of OAT. One problem is that there is no standardisation on colours so you can't rely on pink being OAT and blue being IAT based. And often it's not even stated on the container. Madness. I have 2 containers with antifreeze in my workshop at home. Both are ethylene glycol based, both are the same concentration and manufacturer and from the same petrol station, one is pale green the other is blue. The difference, they were bought a couple of months apart. And the new stock was adifferent colour from the old stock. I really hate when you go on a forum and someone says the correct antifreeze is the blue one, or the pink one. Colour means sod all and changes at the manufacturers whim. I think my quad and car both have aluminium engines and both run on the old glycol antifreezes and neither manual mentions silicates. Just been re reading this and was thinking, must check and see what the Himalayan uses. Actually had the workshop manual on the screen when I remember it´s oil cooled. You're not alone Borsuk. I have, on occasion, had a very brief panic while riding the 125. "Oh god! I can't recall ever changing the coolant on the 125!!" Just that short moment of panic until the brain drops back into gear and I remember it's air cooled. Good to know that I will have company in my senescence.